I'll start by saying yes, it's possible to hide or "spoof" your IP address. But I also think it's important to state upfront that your IP address DOES NOT personally identify you when you use the Internet. If you've heard that hackers with special equipment or software can easily discern your name or physical location, given your IP address, then you've heard wrong. For more information on this, read my companion article Does IP Address Reveal my Physical Location? Okay, that fear is put to rest. If you still want to learn how to hide your IP address, read on. So let's talk about IP addresses for a moment. When you connect to the Internet, your ISP assigns you an Internet Protocol (IP) address, which in most cases changes every time you connect. Your IP address was never meant to be a secret. Whenever you connect to a website, download a file, or chat online, your IP address is sent along with your request to communicate. Think of it like the return address on an envelope... without it, the computer on the other end wouldn't know where to send the reply. A better analogy would be a return address that's a post office box. When that "letter" arrives at the post office, they put it in the correct box, and only the post office knows your true identity. The sender only knows your box number, and which post office handles your mail. Even so, some people are concerned that ANY record of their online activity might pose a threat to their privacy or personal security. And it doesn't necessarily mean that the person is engaged in some sort of nefarious activity. In some countries (or even your workplace) it may be verboten to visit certain websites, so hiding your IP address might provide a way to circumvent the restriction. There are also websites that only allow visitors from certain geographic locations to connect. 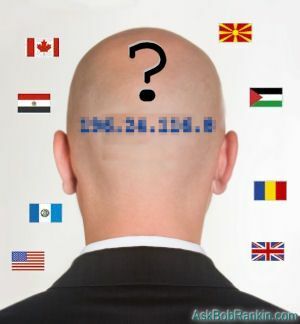 If, for example, you're a citizen of the USA, but living abroad, you might have trouble connecting to some US-based websites, because your IP address will identify you as outside the USA. An IP spoofer that makes it appear you're connecting from within the USA could solve that problem. Some proxy servers are web based. StupidCensorship is one good example. You can visit this site, and enter a web address (URL). The proxy will fetch the page, and return it to your browser. Your browser history will show only that you visited the proxy site, not the URL you entered. And the website you "vistited" will only know that the proxy site fetched a page, not you. There are also downloadable programs to hide your IP addressess, which provide you with a phony IP addressess and location. Firefox’s SwitchProxy automatically switches between a list of proxy servers and can be a handy tool. SwitchProxy is a free service, and can be installed as a browser toolbar. IP addressess Shield 4.6 (US$69) is another such program. It works with both Firefox and IE, IMs, email, file sharing or other applications and will even provide you with a spoofed location in another country. Most recent comments on "How to Hide Your IP Address"
Having said that, using a proxy server and a web-based re-mailer (a website that allows you to send an email to/from any email address without tracing it to your computer) is a good example of where security and privacy are assured (but you'll never know if your anonymous email ever reached it's destination), because it's a one-way scenario. This may not be the most appropriate place to do this, but like all the information supplied by Bob Rankin, it is both helpful and informative. I certainly am no computer geek - I can spell computer, but that's about as far as it goes, yet when I read an article on these pages, not only do they make sense, they are understandable. Thank you very much. How are these solutions for online privacy different than the TOR Project? Any thoughts out there? My ISP has to have a record of my IP address each & every time I log on. Besides I get the impression that my IP address is the same and doesn't change. Therefore my ISP had a permanent record of who I am! Please, anyone! What are your thoughts? Am I correct or is Bob Rankin, regarding a persons IP address? EDITOR'S NOTE: Yes, of course your ISP knows your IP address, since they assign it to you. They are like the "post office" in my analogy. Given an IP address, anyone can see who your ISP is. But only the ISP can identify YOU personally. The RIAA complained to the ISP, who passed it along to you. Some or possibly most ISPs will keep a track of which of their customers used what assigned IP addresses at which times, for security and logging purposes, as well as to be able to track down faults and errors (logs always help when errors occur!). You'll want to check your ISPs policies on what sort of logging they say they do or how they use the information. They may keep these logs for months or years. Its all a matter of you finding out and switching if you don't like your current provider's level of information logging. TOR is a free multi-linked proxy service, as opposed to most paid ones. Most of the time, TOR will be very secure as your traffic gets sent encrypted through many publicly participating PCs and can only be traced at the very end or very start of its travel (where it gets unencrypted to actually ask to view a website or etc). However, if snooping parties decide to participate in TOR, there is a chance (although usually a random chance and not something they can predict) that they will be the end destination for your traffic and be able to see what your request is, although they will have to trace the traffic right back through the other TOR nodes to find that you sent the communication. For most needs TOR is a fine solution for hiding traffic, only very highly resourced parties would be able to track you at all. Private services, you pay to be completely clandestine. They often operate in countries where the law will be on their side if other parties demand for them to release information about you. You know that all information you send out will only ever be tracable to the company and not to you, and you're paying them not to give your identity away. They often also have a policy of not keeping any logs of your usage with them as extra security. Make sure you follow their guidelines and policies to make sure your computer only communicates through theirs and doesn't send out its own traceable traffic. EDITOR'S NOTE: Forwarding an email with Gmail doesn't make it disappear. If anything, you'd have TWO copies -- one in your inbox, and one in the Sent Mail folder. How are you doing the forward? If I send someone on email on facebook, can they trace my IP address? I have uses Hotspot Shield to spoof my IP address. Hello I want to play a game of NCsoft (exteel N.america) the problem is that i'm not in USA; the game is not available in my region. So how can i use this system to connect to its main server. I'm aware that you can use proxyservers on browsers but is it possible for programs like exteel-us. and if it is possible how can i do it? Thanks for the great post. Was exactly what I was looking for. My ISP may not reveal my home address in the headers of my web requests but it sure as heck provides not only the name of my ISP but my town. That pretty much narrows down my physical location. It is scary that ISPs do this to customers. Most are totally unaware of what information their ISP is giving out every time they browse to a website. I only know because I visit Steve Gibsons website and use his free utilities to check my security. I have to say, I am pretty much in the dark when it comes to all this ISP/IP address stuff but I was reading these posts and Im concerned that whenever I send out an email, etc that it will be easily traceable back to me...is this so and if so, how can I prevent it? Not that I am doing anything illegal but I find it very disturbing that my location can be so easily found. @Shea: I use & I suggest a professional unblocker like MicroVPN ! It’s a great software that you can use anywhere, at school or at work, to unblock websites, or to encrypt traffic and protect from your ISP filters and monitoring ! You can check at: https://microvpn.com ! EDITOR'S NOTE: I see you've been quite busy posting these links all over the Web. Wouldn't it be better to disclose your relationship with the product, rather than pretending to be a user?